The PlayStation business has had another phenomenal quarter in the first four months of 2015, selling three million PS4 units and turning in an operating income of $160 million from revenues of $2.365 billion. There are now 25.3 million PlayStation 4 units in the hands of players worldwide - a number achieved in less than two full years. The console continues to be the company's fastest seller - outpacing the PS2, which took two years and eight months to reach the 20 million mark. Furthermore, thanks to dropping production costs for PS4 hardware, a 12 per cent increase in sales from the same quarter last year translated to a massive 350 per cent rise in operating income. A strengthening dollar again hurt Sony's bottom line, having an estimated impact of 15.6 billion Yen on the revenue total of 288.6 billion Yen, but this was massively outweighed by the increase in sales and the efficiency gains of Sony's operation. 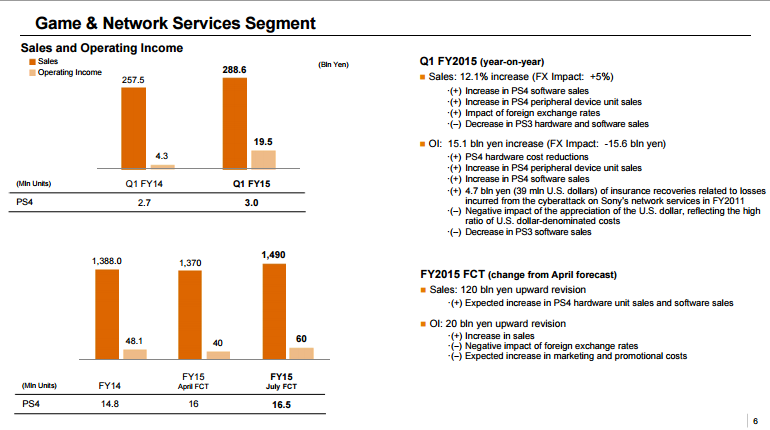 On the strength of the results, Sony has added another 20 billion Yen in operating income to the sector's full year forecast. The sales rate of PS4 shows a healthily steady growth in player base, returning to a gradual upswing after a huge blip in Q3, 2014. Sony has upgraded it full year forecast from 16 million units to 16.5 as a result - a figure which would show a substantial increase on 2014's 14.8 million total. By Sony's own reckoning, the end of Q1 2016 will see nigh on 40 million of the consoles in homes. 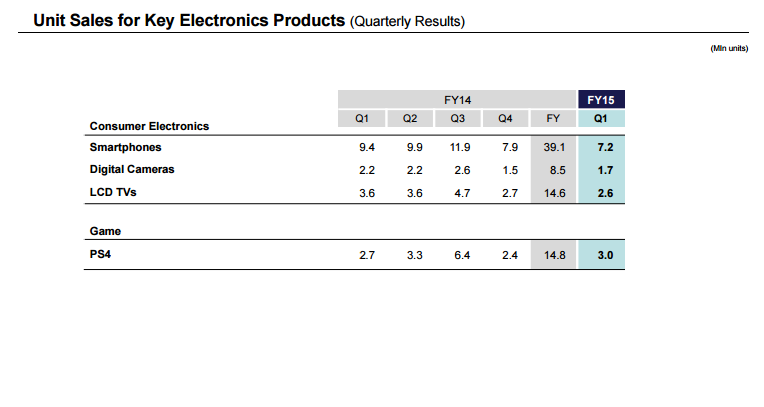 Vita sales once again went unmentioned in the report, whilst the gradual decline of PS3 continued. Hardware wasn't the only success story. Network, ("Network includes network services relating to game, video, and music content provided by Sony Network Entertainment Inc.") made almost as much in revenues, netting around 105.8 billion Yen compared to Hardware's 129.5 billion. The Other category (Other includes packaged software and peripheral devices) brought in 30.6 billion. Overall, the corporation turned a healthy profit, banking $676 million in net from sales of nearly $15 billion. Whilst the PlayStation business is very healthy indeed, it's far from Sony's only, or even biggest, success story: Devices, Imaging, Financial Services and Music all continue to return a higher operating income. Does the game media seem a little subdued over the fact that "Sony has sold more PS4s than Xbox One and 360 sales combined in last quarter"!? I understand the dire-straits that Sony is internally, but would this be more of a news "earth quake" if it was the other way round? Is it the issue that Sony does not pay as much in marketing promotion that sees some media relegate this development to the back sliders?